Join us for an interactive concert/meditative experience/prayer session for World Peace and inner peace. Enjoy this concert with Asheville-based composer, pianist, and recording artist, Richard Shulman and hear the extraordinary sounds of the Kawai concert grand in the geodesic prayer dome of the Light Center. It is an experience of inner and outer beauty not to be missed. Fee: $15 in advance; $20 at door. Call the Light Center to pre-register at 828-669-6845. Here is "A Vision Strongly Held" from the solo piano album "World Peace" recorded on the 40th anniversary of the Hiroshima bombing (Click on the Youtube button to listen). Fri. March 11, 8:00 pm playing piano with the Asheville Jazz Orchestra at White Horse Black Mountain 105c Montreat Rd. (828) 891-8700 Musicians are Richard Shulman - piano, Zack Page - bass, and Rick Dilling - drums. Fri. March 18, 6:15 - 7:00 playing Music of Peace in the lobby of Lipinsky Auditorium before the 7:00 pm performance of "The Peacemakers" performed by the University Singers, the Reuter center Singers and the Asheville Singers conducted by Dr. Melody Galloway, UNC - Asheville. free concert. Thurs. March 24, 6:30 - 9:30 pm participating in the Spring Equinox Peace Meeting led by Allen Levy and students of Hilda Charlton, James Chapel of the Union Theological Seminary 3041 Broadway at 121st Street, New York, NY 10027. Come and join in an offering of music, meditation and prayers for peace and freedom. Wed. March 30, 6:30 - 7:30 pm Playing for a Jazz Vespers at TRINITY PRESBYTERIAN CHURCH, 900 Blythe St., Hendersonville, NC 28791 (828) 692-6114 I'll be joined by Shannon Hoover - bass and Sonny Thornton - drums. Mon. 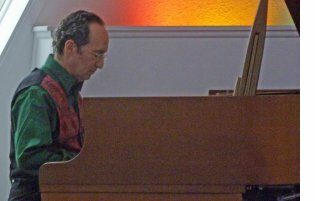 April 4, 7:30 - 10:00 pm playing piano with Dr. William Bares as part of his "Take Two" concert series at White Horse Black Mountain, 105c Montreat Rd. Black Mountain, NC 28711 828-669-0816 Admission $12, students $6.